Klimkin and Trump discussed the ways of settling the situation in Donbas. Ukrainian Foreign Minister Pavlo Klimkin during his visit to Washington and meetings with US President Donald Trump and Vice President Mike Pence on 11 May discussed the possibility of involvement of the United States in the talks on the settlement of the situation in Donbas in the framework of the Normandy format. "The situation in Donbas and the implementation of the Minsk agreements were discussed, and the American side has a clear understanding of what the Russian aggression is and how threatening it is [...] The issue of involving the American side in settling the situation [in Donbas], including the Normandy format was discussed," the foreign ministry's spokeswoman Maryana Betsa said in a commentary to Interfax-Ukraine on Thursday..
Betsa also noted that the American side reiterated its unchanged position on supporting Ukraine in countering Russian aggression, supporting Ukraine's sovereignty and territorial integrity within recognized borders. 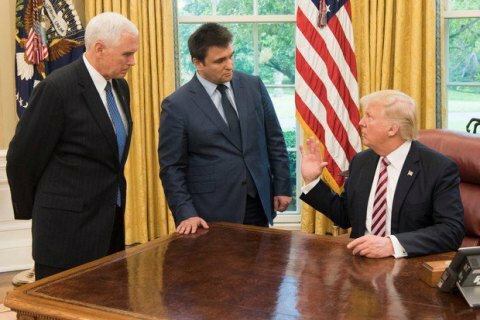 Previously, Trump received Klimkin at the White House and discussed with him the situation in Donbas and the further support of Kyiv by Washington. Before that, the head of the Ukrainian foreign ministry met with Pence. Klimkin was in Washington to attend a meeting of the base group of the Munich Conference. the expansion of the Normandy Four (Ukraine, Russia, Germany, France) are have been repeatedly raised at various levels. The most popular proposal is to include the United States and Great Britain as the guarantors of Ukraine's security under the Budapest Memorandum. Poland also expressed the desire to join the talks, but this proposal was blocked by Russia in 2014. The main problem the Normandy format is the lack of significant progress in the peaceful settlement.